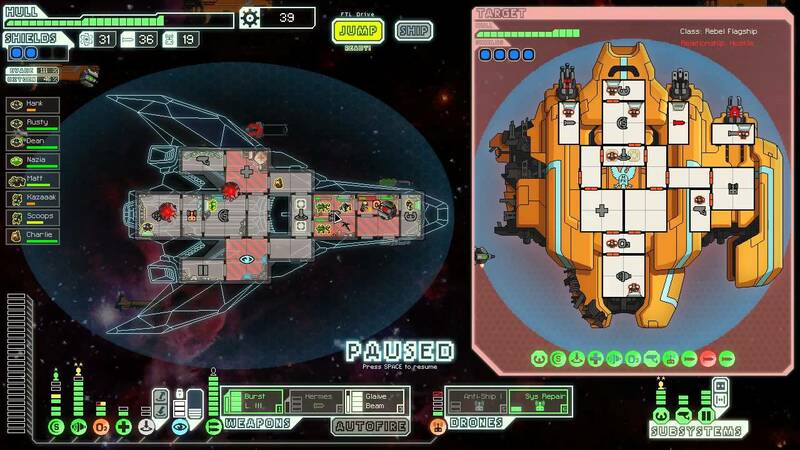 FTL is a popular top-down episodic sci-fi spaceship management simulator with roguelike roots. How’s that for a fistful of genres? If you’ve never played it, imagine The Sims but set in space with more house fires. Or better yet, go buy it on Steam. The game is short, sure, but it keeps drawing me back in over and over again. Why? What is it about the randomized storyline and simple 2d graphics that keeps re-engaging me? The Nesasio, preparing for launch. I selected the type-A stealth cruiser for this playthrough (The Nesasio). The stealth ships have produced the most engaging gameplay in my playthroughs; they’re extremely high-risk, high-reward designs that usually coax ridiculous shenanigans from my otherwise cautiously-build-lots-of-shields-and-peck-them-to-death-from-extreme-range playstyle. The Nesasio doesn’t even start with shields! It’s a design that relies on striking first and hardest to survive, so it will be a good opportunity to reach outside of my comfort zone. I don’t understand why people seem to prefer the type-B. 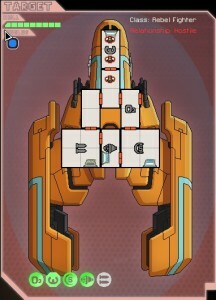 Sure, the Glaive beam is nice on paper . . . until you realize that it takes forever to charge, and if you can’t land the first few blows with the stealth cruiser you’re pretty much dead (remember what I said about the lack of shields?). For this playthrough I took a few extra points of evasion and some sensible, fast-charging weapons instead. With that in mind, The Nesasio set out on its journey. What dangers will Kusy, Weston, and Kletzkin face? What perils will they brave? What fascinating new technologies will they discover? And can they outrun the Rebel fleet, hot on their heels? 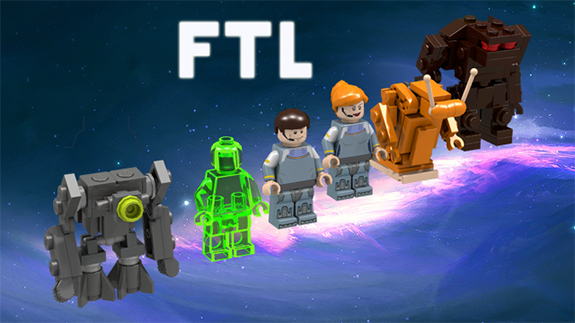 FTL operates on a completely modular storytelling model. This modularity is knotted together with the roots of its core gameplay mechanic–the game is divided into tiny “episodes” with each jump that your ship makes. Each episode is chosen at random from a set of potential episodes, depending on the type of sector that you’re in. The number of episodes that you’ll experience isn’t fixed, and apart from two special cases (quest markers and unlocking new ships) they’re completely interchangeable. The only thing that carries over from episode to episode is the condition of your vessel. Does storytelling “in the micro” matter at all (if you can just insert and remove pieces of it at random)? How much control over the story does the player have? And does this control strengthen the story? Can the modular storytelling method actually strengthen a game? 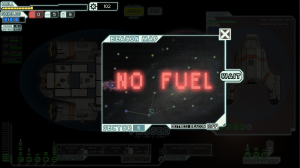 What’s the real narrative at work in FTL? I played aggressively through the first sector, knowing that without some quick gains in equipment and scrap The Nesasio would quickly be out-gunned by its Rebel opponents. This strategy nearly backfired when my second opponent was a well-armed Rebel fighter; its drones and heavy laser weaponry played havoc with The Nesasio’s unshielded hull. Fortunately my pilot, Kusy, managed to evade some of the most destructive blasts, and The Nesasio’s titanium system casing kept the weapons online long enough to chew through the Rebel’s own inadequate shielding. Limping through a nebula, I scored some lucky early hits on Rebel drones and poorly-armed pirates; my daring crew freed another human, Luaan Ti, from a slaver, and finally we found refuge with Mantis traders hiding their black market hub inside of a dead space whale. While repairs were underway, a slug named Chriz offered his services to us. I accepted, hoping that the slimy creature’s nefarious capacity for cunning and latent telepathic abilities would help us profit via some non-violent methods (The Nesasio’s hull was still naked as bare durasteel). If the modular storytelling used throughout the first seven sectors of FTL removes the possibility of recurring characters, slowly-developing plot arcs, and most other common storytelling techniques, what’s left? How can the episodes still be effective? The answer can be summed up in one word: atmosphere. There are thematic elements and common characteristics that recur, over and over again, within each episode. The event descriptions are short–often no more than a few sentences–and you’re always reminded that the Rebel fleet is close on your tail. The events are interchangeable, but the conflict is not; you’re confronted over and over again with the choice between delaying your journey (for the chance to make your ship more powerful) and widening the gap between you and your pursuers (at whose hands you will die a violent spacey death). The episodes are not in-depth explorations of the FTL universe; rather, they rely on flags that invoke other common tropes of the science fiction genre. Every fantasy book since Tolkein has had humans, elves, dwarves, orcs, etc. ; every sci-fi story since Star Trek has had a warrior race, space pirates, a telepathic species, ships hiding in swirling nebulas, battles through asteroid fields, etc. When the game tells us that a captain is hailing us on the viewscreen, we know exactly what it’s talking about even though there isn’t a single bit of description. Send a shuttle down to the surface of this planet (even though there’s no shuttle bay modeled on any of the ships)? Of course! That’s just what people do. In the same way that a sitcom assumes we’re familiar with the tropes of day-to-day life, FTL assumes we’re familiar with the tropes of science fiction. Each episode, despite its bare-minimum level of description, is tapped into the huge library of science fiction media that you already have in your head. My journey continued through rock and pirate-controlled sectors, a combination of lucky hits, desperate evasive maneuvers, and last-ditch hand-to-hand brawls between my crew members and alien attackers. The perils of space seemed far more dangerous than the Rebels behind us; except for a few scouts, The Nesasio’s screens had been clear of the Rebel threat. By the end of the fourth sector, I could tell that my ship’s weapons and shielding systems were woefully under-powered despite my aggressive attempts to net additional scrap and more components. Instead of trying to pass through yet another rock sector, I decided to gamble and press through the Slugs’ home nebula. Slugs are notorious for their love of fire and anti-crew tactics; I hoped that they’d be a little kinder to The Nesasio’s battered hull than the Rock pirates had been . . . The next battle was easier, though, and I convinced the slugs to give me the coordinates of a secret construction platform. Chriz, my ever-mercenary slug crew member, helped us navigate the nebula, and after defeating a small Slug interceptor we scored an experimental Slug Cruiser! I look forward to trying it out on the next playthrough. Were The Nesasio’s fortunes were looking up? Besides the occasional quest mission and the side stories to unlock additional vessels, there’s one important thread that ties all of the episodes together. This thread is your ship. I’m working on a longer discussion about this (for an upcoming Homeworld post), but your ship is something between a character, a player avatar, and a record of everything that’s happened so far. In my game, I had several crew members (whose species were not traditionally very skilled at hand-to-hand combat) become quite adept at cross-corridor firefights and engine room brawls. We were boarded so many times that I had no other choice; but luckily, they survived. I also never found weapons powerful enough to reliably break through energy shields; instead, The Nesasio came to rely on a teleporting bomb to bypass them and disable the shields from inside. Effective episodic storytelling leaves marks on the characters that persist, even if the episodes themselves are randomized. Outta gas . . . Speculation as to The Nesasio’s improved fortunes was quickly corrected as Rebel forces pounced on us the moment we exited the nebula. Fortunately we were able to slip away with only a single direct hit . . . but it consumed the last of our fuel as the ship arrived in the heart of a deeper, uncharted nebula. We handily defeated the single Rebel scout that had been able to follow us in our desperate flight, but without fuel for the jump drive The Nesasio was going nowhere. 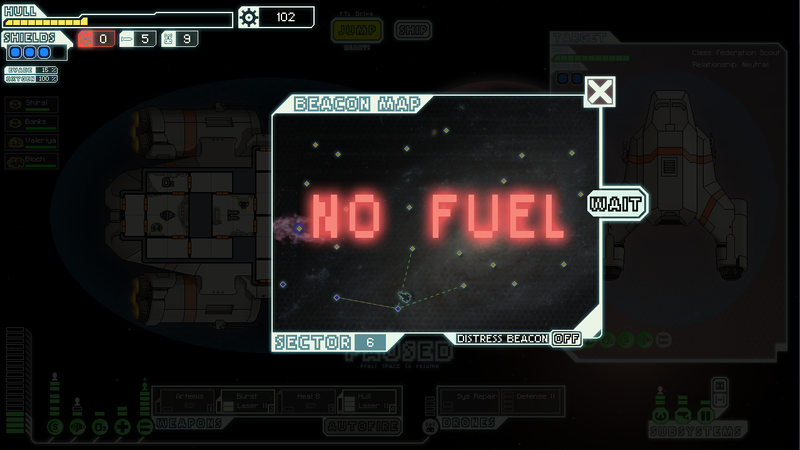 I debated the risks of turning on the vessel’s distress beacon, but in the end decided to try it. The roll of the dice paid off; an automated ship materialized out of the mist with fuel for sale. It was expensive, but better than being stranded. After a few more battles, The Nesasio arrived in the last remaining stronghold of Federation territory intact, only moments ahead of the Rebel fleet. 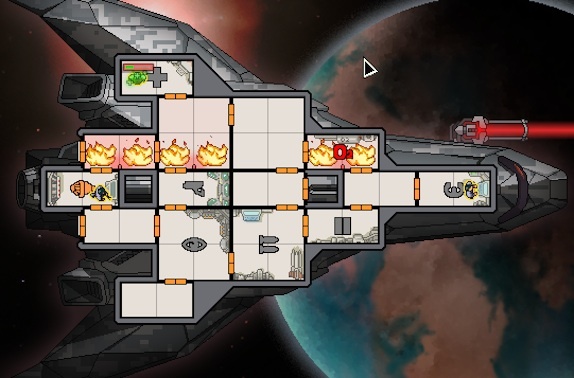 I’d cobbled together a strange collection of weaponry–two drones, a teleporting breach bomb–but with any luck, I hoped to scrape out a victory against the Rebel flagship. 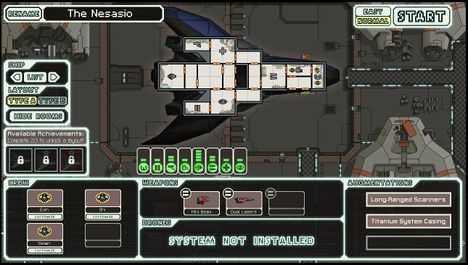 The macro-story of FTL is the same every time. 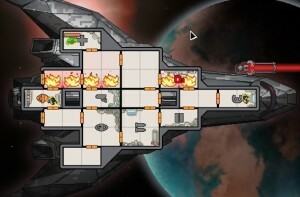 Flee from the rebels–overcome some challenges–defeat the flagship (or die trying). You have very little choice in which episodes occur. Sure, advanced sensors will tell you whether or not there’s a ship in the adjacent system, but they’re imperfect and there’s no guarantee as to whether the ship is friend or foe. It’s a game of randomized challenges that you have no control over. But you do have control over how to handle those challenges. The palate of tools at the your disposal is nearly as varied as the selection of violent spacey deaths arrayed against you. It’s a trademark of good micro-storytelling that each episode, while interchangeable, is distinctly different and presents unusual challenges. 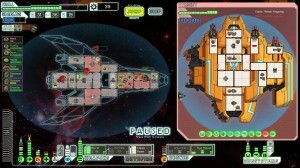 By lowering the cost of defeat by shortening the game, encouraging multiple replays with a wide variety of unlockable ships, and building a great deal of variety into the randomized threats FTL is sure to produce situations where you manage to escape by the skin of your teeth (or go out in a blaze of glory). These are the situations that result in great stories. These are the situations that you tell your friends about later over drinks (or via blog). And these are the situations that construe the real narrative of FTL, because the story of FTL is actually the story of how you play FTL. This is where modular micro-storytelling shines. Sadly, this journey ended in defeat. The Nesasio’s piecemeal weaponry just wasn’t enough to crack the rebel flagship’s impressive shields. The teleporting breach bomb was effective until it ran out of ammunition, and with only two additional weapon slots the type-A stealth cruiser just didn’t have enough firepower to break through (even with an anti-ship drone). Perhaps if I’d invested in crew teleporters and tried a boarding party . . . but hindsight is 20/20. I did have the rare opportunity to purchase a lock-down bomb early in the game, but not enough money to do so. The Nesasio was durable enough to survive the flagship’s incredible firepower, but while scrambling desperately to find more ammunition for the breach bomb the Rebel flagship got within range of the Federation base and all was lost. It’s the first time I’ve lost a game this way, but that’s okay–I’m looking forward to using the Slug Cruiser on my next playthrough . . . Contrast this with The Walking Dead. Player choice is the characteristic that make video games a unique storytelling media. When it’s done well, very little else matters, and when it’s done poorly, again–very little else matters (I’m looking at you, Skyrim, and the exactly 4 hours I played before I got bored). When you’re given control over the “how” of the game, then it becomes a vehicle for self-definition. There’s the narrative of the game, sure, but then there’s the narrative of who we are while playing the game. Video games can use our input to answer the question, “Who am I?” The quest for self-identity is what gives them power, and what makes them so tricky to design well. FTL asks us how we handle pressure and situations where we never have quite what we need. The modular episodes are an ever-shifting challenge, something that we can never merely memorize our way through. It tests our ability to improvise, adapt, and evaluate risk. It’s not the only way to tell a story, sure. But it’s a pretty good one.